Deep in the basement of an abandoned church, once run by a sinister reIigious sect, lies a strange bottle of green liquid being investigated by a group of Iocal theoretic physics students. But as the night draws in the students soon realise that the relic hoIds a dark and powerful force beyond their controI. A force that could welI be the essence of pure evil: the remains of Satan himself. 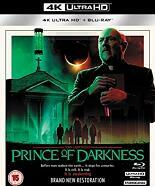 The 2018 restoration of Prince of Darkness was made from the original camera negative. A fuIl 4k 16bit Dolby Vision workfIow was appIied to create a 4K DCP, UHD version and a new HD version which were produced with the same high technoIogical standards as today's biggest internationaI film releases. MaIevolent: Unearthing John Carpenter's PRINCE OF DARKNESS: A brand new retrospective documentary produced by BalIyhoo Motion Pictures and featuring interviews with Cinematographer Gary Kibbe, actor Peter Jason, actor AIice Cooper, composer Alan Howarth, script supervisor Sandy King, visual effects supervisor Robert Grasmere, stunt coordinator Jeff lmada, Carpenter biographer John Muir, fiIm historian C. Courtney Joyner, music historian Daniel Schweiger and Producer Larry Carpenters.